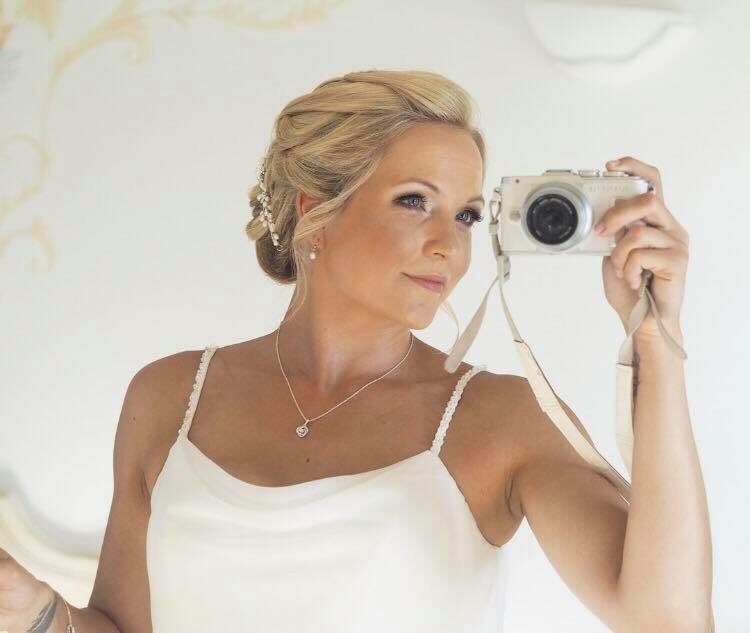 This week’s Behind the Bride is with… me! I thought it would be fun to answer the questions I usually ask other brides, now I have had a few months to reflect on our own wedding day! Our wedding was on 2nd September 2017, in sunny Santorini! I can’t believe it will be six months since our wedding on Friday, it has flown by! I met Ed when we were both working at a local hotel. He was the reservationist, and I was the wedding coordinator. When we first met I was married, but unhappily so. We were friends at first but when my marriage broke down, Ed supported me through what ended up being and extremely difficult 9 month period, and I knew that he was the man I was meant to end up with. I recently shared our proposal story, so I won’t go into too much detail, but he set up a treasure hunt for me, culminating in a meal at our favourite restaurant, and it was the most romantic thing anybody has ever done for me. I loved how thoughtful it was! We got married in Santorini. From the start, we knew we wanted to go abroad for our wedding. I had already done the big white wedding back home, and as we worked in the hotel industry at the time, we didn’t really want to go to anywhere which we already knew. Santorini is absolutely stunning, and although neither of us had been there before, we had both been to destination weddings on nearby islands, and figured it would be a lovely backdrop for our big day. As we were travelling by plane, I was limited in what we could bring over, so kept decor to a minimum. We went with a pale blue colour scheme, with other pastel shades making an appearance too, and I loved how this looked against the whitewashed walls and brilliant blue sky of Santorini. I have two. One was looking out across the stunning caldera, having my photo taken with my brand new husbdand, with our close family and friends looking on. The other would be in the evening, when the free bar was open, all the stress was gone and I was able to just dance the night away and really enjoy myself. It was incredible! I do wish that a couple of people who weren’t there had of been able to make it. I hate that those people aren’t a part of my special memories from our day, and missing from the photos. I also wish that we had gone with a different company, as they almost ruined the day for us with their incompetence. Although our day was beautiful, the stress I was under in the lead up, and even the day before the wedding, was just not nice, and I wish the day hadn’t been tainted by that. On the day itself, the makeup artist turned up extremely late, and I felt very rushed, and a couple of other things with the meal and cake weren’t right but in the end, it didn’t matter, they are only small details, and it could have been much worse judging by the issues we had been experiencing from the organisers! Try not to stress about the small stuff, it really won’t matter on the day. If you are getting married abroad, research the company very well beforehand, make sure you read reviews and always trust your gut instinct. In general, book early to avoid disappointment, don’t sort details until you are certain, and try and enjoy it, the wedding day goes so fast, I wish I could go back and do it all over again!